St. John's wort (Hypericum perforatum) is one of the best-selling herbal medicines in the world. For that reason, research into all aspects of St. John's wort continues to intensify. Hypericum: The Genus Hypericum summarizes the current knowledge on a wide range of issues, such as botany, plant infections, cultivation, manufacturing, standardization, quality control, biochemistry, pharmacology and clinical application. This landmark book tackles issues not previously addressed, such as selection of the pharmacologically active compounds, application for severe depression, mechanisms of action, long-term effects and risks, marketing issues (dietary supplements or drugs), and comparison to synthetic drugs for the same indications. Containing many updated references, Hypericum will be of immense value to those involved in industry and academia alike, including researchers, producers, processors, importers and end users. "The volume is richly illustrated with pictures, … drawings, diagrams, and graphs. … Researchers in various fields of both academia and industry, such as botany, agriculture, pharmacognosy, phytochemistry, the food, flavor, cosmetic and fragrance industries, (alternative) medicine, and other pharmaceutical and health fields will find this volume of great benefit for their work. [This book] is therefore recommended for academic libraries supporting programs in any of the above fields, as well as a wide range of corporate libraries." 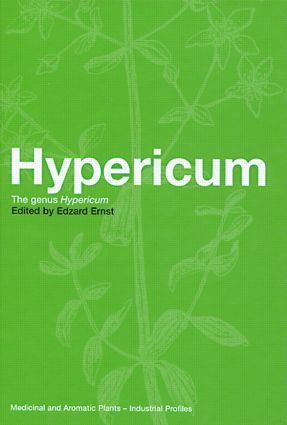 "Many authors contributed their findings to this account…addresses the important issues of manufacturing, standardization, and characterization…discusses culture and biotechnology…This volume's chapters are well referenced and will do much to inform health care professionals, biochemists, and botanists about the potential of this genus"
Hypericum Botany. Colletotrichum Gloeosporiodes as the Cause of St. John's Wort (Hypericum perforatum) Dieback in Switzerland and Breeding for a Tolerant Variety. A Virus Causing Yellow Veins and Necrotic Leaf Spot of St John's Wort (Hypericum perforatum L.). Manufacturing Standardisation and Characterisation of St John's Wort Herb Extracts. Culture and Biotechnology of Hypericum. Chemical Constituents of Hypericum ssp. Determination of Hybericins and Hyperforin in Herbal Medicinal Products. Secondary Metabolites Content of Hypericum sp. in Different Stages and Plant Parts. Herbal Medicinal Products of St John's Wort: Manufacturing and Quality Control. The Potential of in vitro Cultures of Hypericum perforatum and of Hypericum androsaemum to Produce Interesting Pharmaceutical Compounds. The Clinical Pharmacology of Hypericum perforatum. Hypericin as a Potential Antitumor Agent. Neuropsychopharmacological Studies on Indian Hypericum perforatum Linn. The Efficacy and Safety of Hypericum in the Treatment of Depression.